Uses Secure Socket Layer Encryption for sensitive credit card information. tip: Hold Mouse over quantity boxes below to see prices from cart. Once added to the cart you can view prices & change quantity if desired. STEP 3: When done shopping, click on the CHECKOUT NOW button below. Most product ships within 24 hours, weekdays. Shipped directly from AIM warehouses. 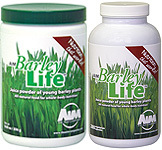 AIM has been providing barley juice powder since 1982. Without exception, BarleyLife is the best for quality and price. Nutrition our Bodies Crave but seldom get. BarleyLife contains concentrated naturally occurring plant nutrients: enzymes, chlorophyll, amino acids(protein), vitamins, minerals, antioxidants, and scores of phytochemicals. Over 30 years of user tested good results. Experience the difference or your money back! Membership benefit Info Free AU AIM Membership with minimum order. Paid AU AIM Membership Check this box if you would like to become an AIM Member without a minimum order. Spouses Name: Enter spouse's name if desired on your Member account. This allows them to order direct also. PIN CODE: Enter a PIN code that you would like to use with your New Membership Account (be sure to check the FREE AIM Membership box above). Shipping/Handling Shipping is FREE with Membership sign-up (free shipping on the first order with Member sign-up only). Otherwise shipping is $10.50 per package. Each time the "ADD to Your Shopping Cart" button is clicked every item with a check mark or a Quantity entered in the table above will be added to your shopping cart. Orders are processed quickly, shipping is within 24 hours (business days) in most cases. Delivery time is usually 2-7 business days. We typically use Australia Post's e Parcel as the carrier.